What is Femoro-Acetabular Impingement ? Femoro-acetabular Impingement (FAI) is a condition where the bony shape of femoral head (ball) or the acetabulum (socket) is abnormal, resulting in progressive injury to the hip joint cartilage. Due to the abnormal shape of the hip joint, the thigh bone abnormally strikes against the rim of the socket during activity, causing damage to the socket lining. FAI is a leading cause for the development of osteoarthritis, particularly in men. 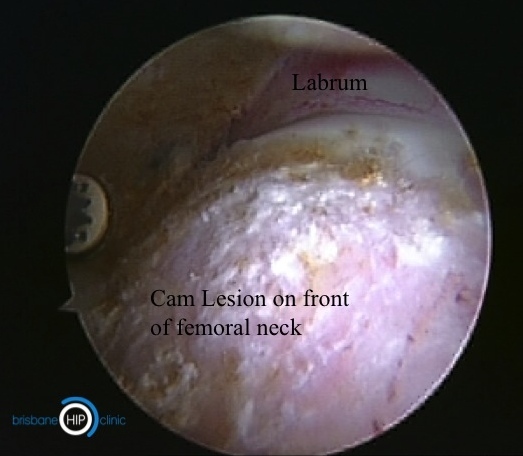 Figure 1: Femoroacetabular (FAI) "cam" lesion. Abnormal ridge of bone at the upper end of thigh bone marked (arrows). What is causes FAI ? The abnormality in shape of the hip joint may be present at birth or develop in early childhood. Some childhood hip conditions may result in irregularity of the shape of the upper thigh bone. In most cases the condition has been silent (without symptoms) and unrecognised for many years. Is FAI always harmful ? No. In fact, the majority of people who have minor irregularities in the shape of their hip joint never develop premature cartilage damage or osteoarthritis. Whether FAI causes damage to the hip joint or not depends on a number of factors - including joint shape, hip flexibility, functional range of motion and activity demands. My radiology report states I have FAI - should I be concerned ? Even if a hip joint shape irregularity consistent with FAI is detected on MRI or CT, in the absence of symptoms (pain), surgery is very rarely (if ever) indicated. The usual recommendation in this situation is for continued observation. Should groin pain that is suggestive of cartilage injury within the hip joint develop in the future, further investigation and treatment may then be recommended. 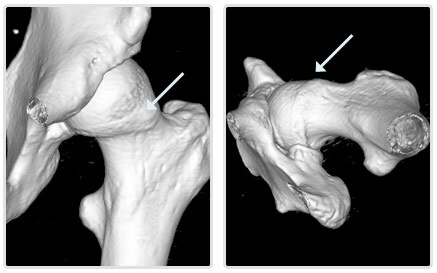 The reason for this approach is that with modern medical imaging, detection of hip joint FAI shape irregularity is in fact very common, however the majority of people with non-symptomatic FAI are not necessarily at increased risk of developing premature arthritis. What are the consequences of symptomatic FAI ? Patients with FAI may experience hip discomfort and pain due to cartilage injury. Due to irregularity in the shape of the hip joint, most people will also describe stiffness of the joint, often since childhood. The symptoms fluctuate according to activity levels and are often made worse by sport and activities which require deep bending of the hip (for example getting out of a car). Some patients report a history of repetitive 'groin sprains' which typically are slow to settle or recur easily. In the long term, FAI causes progressive damage to the cartilage on the rim of the hip socket, leading to osteoarthritis. While osteoarthritis is a slow process to develop, surgical treatment of the abnormality causing FAI may slow or prevent the progression of joint damage and improve symptoms. I've never had a pain from my hip before, why now ? The hip does not become painful until enough damage has accumulated in the joint. The first symptoms are often mild groin discomfort. Once the joint becomes painful, a gradual deterioration can reliably be predicted, however reducing your activity level may reduce the symptoms. It is useful to note that the FAI shape irregularity itself does not cause pain - it is the cartilage injury caused by FAI that results in discomfort. Many patients with FAI or early arthritis can improve their symptoms by reducing or modifying their activity levels, together with the use of pain killers and anti-inflammatory medications. Surgical treatment depends on the type of FAI and its cause. In the absence of significant arthritis, many patients with FAI are suitable for surgical treatment, broadly known as hip preservation surgery. The most common surgical method of treating FAI is hip arthroscopy (minimally invasive key-hole surgery - see below). Other less common surgical treatments for FAI include open debridement, femoral osteotomy and triple pelvic osteotomy. I will recommend a particular treatment based on the assessment of your condition. What are the limitations of hip preservation surgery ? Hip preservation surgery cannot reverse arthritis. 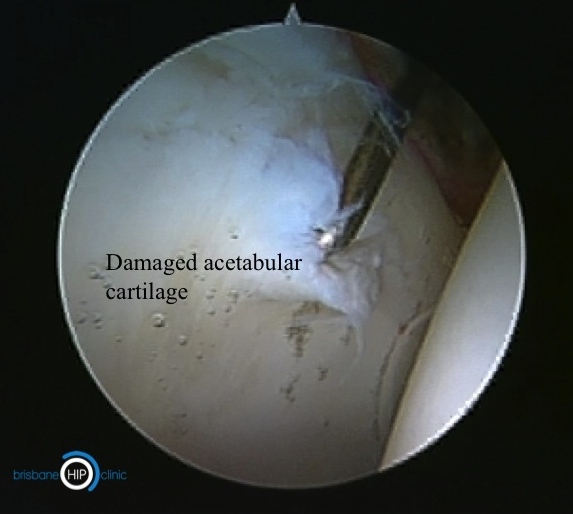 The greater the accumulated cartilage damage within the joint, the less predictable and effective the results of joint preservation surgery procedures become. For this reason, joint preservation surgery is generally not recommended for people with more significant cartilage damage or established arthritis. In these situations, alternative treatment methods may prove more effective. 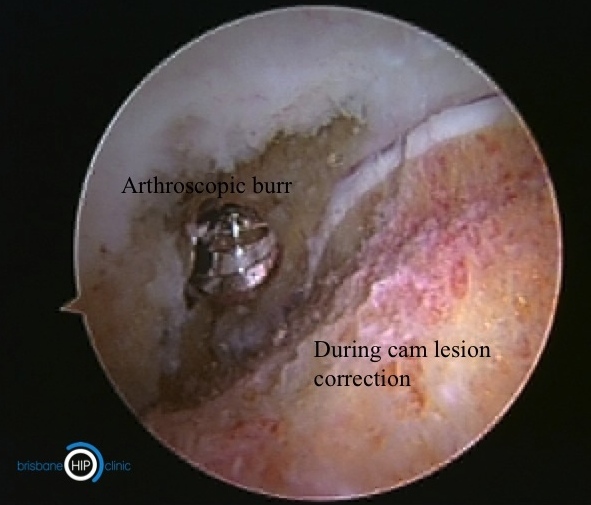 Arthroscopy is key-hole surgery of the hip joint using a 5mm fibre-optic camera. This is by far the most common method of treating FAI. Arthroscopy allows the surgeon to safely and accurately assess damage to the hip joint and to perform corrective procedures. Generally this will involve treating the damaged cartilage (in order to reduce pain) and also correction of the FAI shape (in order to improve functional range of motion and reduce the rate of accumulating progressive cartilage injury within the joint). Hip arthroscopy is a minimally invasive procedure which allows a relatively rapid post-operative recovery and is useful in the treatment of FAI. The most common types of FAI can often be treated with an arthroscopic bone reshaping procedure called an osteoplasty. What is an open hip debridement ? Open debridement is an uncommon operation for FAI, usually used in situations where the shape of the ball or socket is too distorted to allow treatment by arthroscopy, or where the portion of bone that needs to be reshaped is more reliably accessed using an open procedure. Open debridement procedures typically use an incision located either on the side of the thigh or around the lower bikini line (anterior approach), allowing the bone of the hip joint to be reshaped. As arthroscopic mangement allows a much faster recovery with lower complication rates, open debridment is now only rarely used for FAI management. What is a femoral osteotomy ? Femoral osteotomy is a procedure used to realign an abnormally twisted thigh bone and in modern practice is very rarely used for FAI mamangement. A femoral osteotomy can be used to treat FAI, but can also provide improved range of motion to the hip joint and help correct leg length inequality. A femoral osteotomy involves cutting the thigh bone and placing a metal plate and screws to hold the bone in the corrected position until the bone unites. Femoral osteotomy is sometimes combined with an open hip debridement. What is a triple pelvic osteotomy ? Triple Pelvic Osteotomy (TPO) is an operation used to correct an abnormally directed hip socket. This procedure is only very rarely performed for FAI. TPO is performed by making two incisions, one in the buttock region and one around the lower bikini line. The pelvic bone is cut in three places, and the hip socket is rotated into correct alignment. A metal plate and screws are placed to hold the hip socket in the corrected position until the bone re-unites. 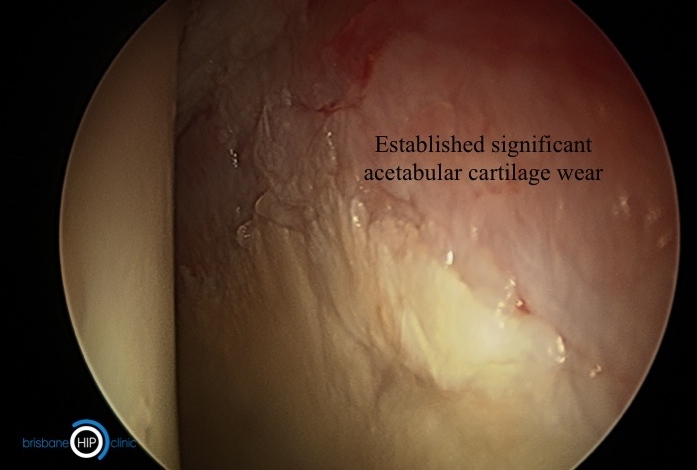 Figure 2: Arthroscopic image of the right hip joint demonstrating a typical pattern of early cartilage damage as a result of cam-type femoroacetabular impingement. The femoral head cartilage is typically undamaged until late in the disease process. 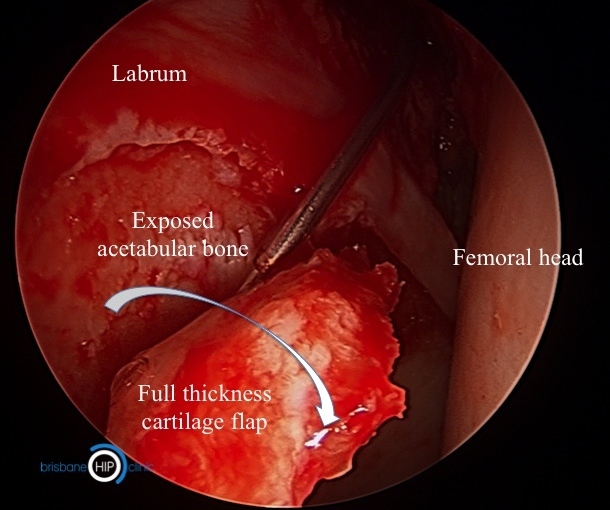 A characteristic feature of FAI injury is delamination of full thickness cartilage sheets from the acetabulum in the anterior portion of the joint (see explaination below). Figure 3: Arthroscopic "periperal compartment" image of the right hip joint without of application of traction. Cam lesion observed upon the femoral head-neck junction that impacts upon the acetabular rim in flexion and internal rotation. 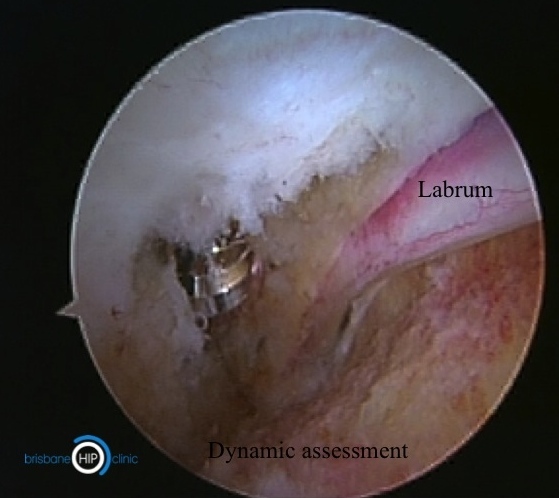 Figure 4: Arthroscopic cam lesion resection and intra-operative dynamic assessment of functional range of motion. Free range of motion into combined flexion and internal rotation without bone impingement. With the hip joint in flexion, patients typically gain 20-30 degrees of internal rotation. Figure 5: Two distinct patterns of wear. Acetabular cartilage wear in the hip joint occurs in two distinct patterns that can be best understood by considering these examples. The upper two images demonstrate thinning and failure of the bearing (tyre or cartilage) as a result of the accumulation of microscopic wear damage over a long duration of time. This best describes "ordinary" osteoarthritis. The lower images demonstrate a very different mechanism of damage - the bearing surface is of good quality but is losing contact and delaminating in full thickness sheets, like a car tyre re-tread detaching. This second mechanism of cartilage failure is typical for cam-type FAI. 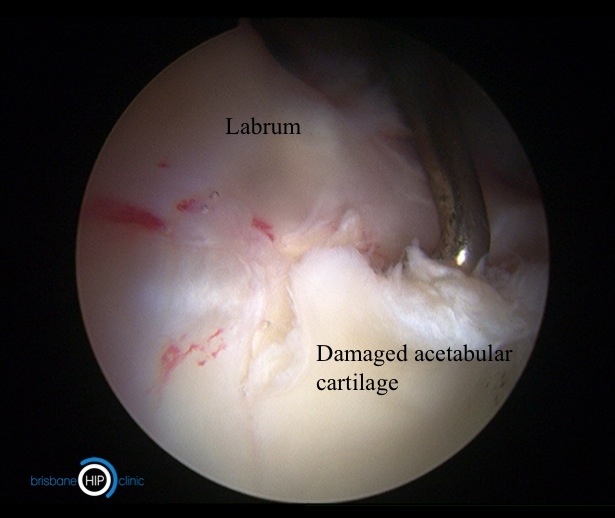 If caught in the early stages, the delaminating cartilage can be salvaged and reattached. Figure 6: Sequence of repair and salvage of a large cartilage flap in FAI. Left: Large full thickness cartilage flap delamination, typical of cam FAI. 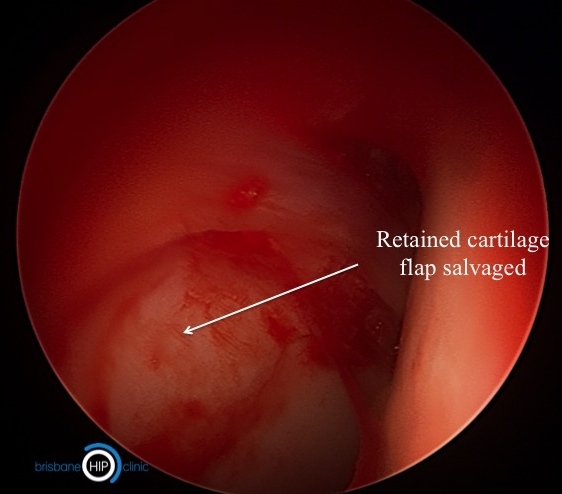 Centre: After debridement of the freyed cartilage edge, the majority of the cartilage flap is judged to be suitable for repair. 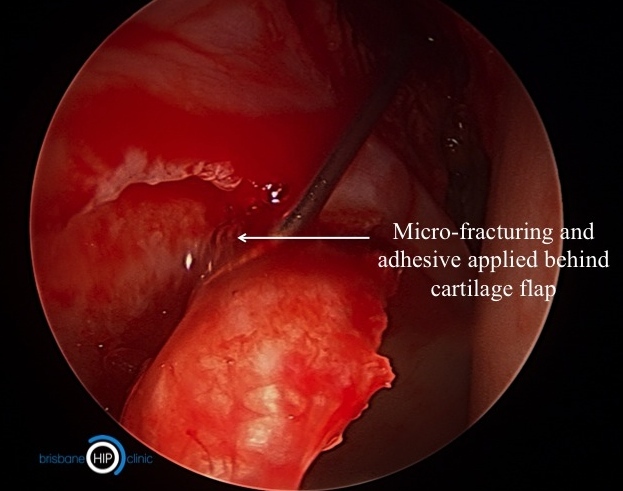 Microfracture/ microabrasion is conducted behind the lesion to stimulate biologic adhesion between the cartilage flap and underlying bone. 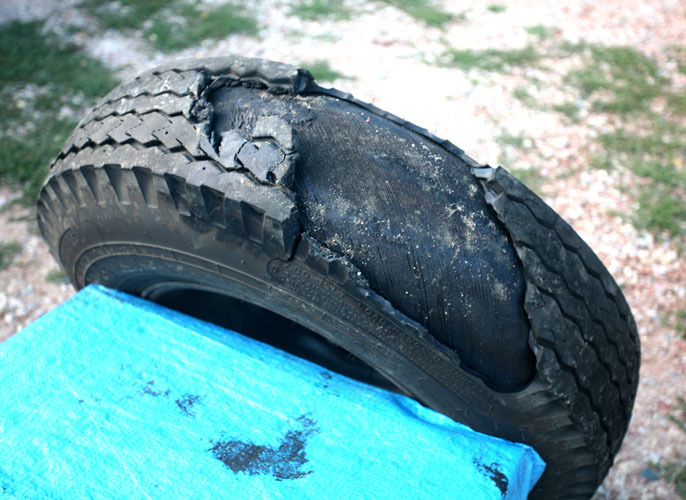 Initial repair stability is augmented by the use of an adhesive. Right: Appearance after repair with retention of a good quality cartilage flap. Resection of the cam lesion which caused the initial delamination lesion is now conducted. This information handout has been written by A/Prof Patrick Weinrauch for the purposes of patient education. The details provided are of general nature only and do not substitute for professional recommendations based an individual clinical assessment. © A/Prof Patrick Weinrauch. Brisbane Hip Clinic. 01/2016.